R3: Ch1, turn. (Sc, ch2, sc) in next ch2 sp. R8: Ch3, turn. Dc in first ch3 sp. 3dc in next ch3 sp. 3hdc in next ch3 sp. (3sc in next ch3 sp. ) twice. Dc in next ch3 sp. R9: Ch3, turn. Dc in next st. Sk next st.
(3dc in next st. Sk next 2sts) 5 times. R10: Ch3, turn. Dc in next st. (Ch3, sc in sp bet next 2 3dc sets) 5 times. Ch3, sk last 3dc set. Dc in last 2 sts. R11: Ch3, turn. Dc in next dc. Ch2. Dc in last 2dc. R12: Ch3, turn. Dc in next dc. (Ch1, sk ch sp, 3dc in next sc) 6 times. Note: This is your eyelet row to weave the ribbon through. EDGE: Ch3, turn. Sc in next ch sp. (Ch3, sc in next ch sp) across R14. Sc in the 3rd ch of the beg ch4 on R14. Cut the ribbon to wrist length plus an extra inch or two. Weave the ribbon through R14 of the glove. Fold each raw edge of the ribbon under about 1/4" inch, fold once more to hide the raw edge, then secure the end by sewing the edges with a needle and coordinating thread. 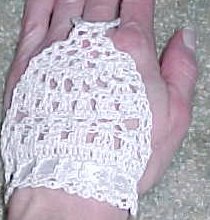 Fold the ribbon ends together around wrist and mark where to sew the snap. Sew on the snap and you're finished. To wear it... put your middle finger through the finger loop and then snap the ribbon closed around your wrist.